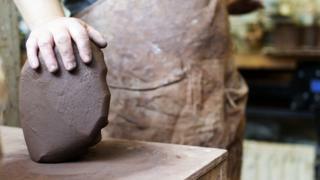 Who, What, Why: Why do people eat clay? The US actor Shailene Woodley raised eyebrows this week after revealing on a chatshow that she eats a teaspoon of clay a day. But is it good for you? In an earlier blog post, Woodley - who played George Clooney's daughter Alexandra in the Descendants and is the star of teen movie Divergent - wrote that clay was one of the healthiest things you can put in your body. "I've discovered that clay is great for you because your body doesn't absorb it, and it apparently provides a negative charge, so it bonds to negative isotopes. And, this is crazy: it also helps clean heavy metals out of your body." She learned about it from an African taxi driver, she said. Some of her friends make clay toothpaste that you swallow instead of spit out. She cautioned that it was important to get it from a safe source. Eating soil or its component parts is known as geophagy. Eating clay - sometimes in tablet form - is common in parts of Africa and the Middle East, says Rick Wilson, director of nutrition and dietetics at King's College Hospital. Zinc deficiency is the most common reason. And kaolin - made from white clay - is sold by chemists to treat diarrhoea. But zinc deficiency is not a problem in developed countries. And the idea of "negative isotopes" being a health concern that needs to be tackled is "a whole load of rubbish", Wilson adds. He links it to a wider trend of nonsensical health fads emanating from celebrities. "Often with health fads there's a tiny element of truth. Then it's blown all out of proportion and a trend starts." Image caption Shailene Woodley believes clay is "one of the healthiest things you can put in your body"
Clay could even do you harm if it's not food-grade quality - it can contain arsenic or lead. Pregnant women sometimes crave dirt, clay or charcoal if their bodies are deficient in key minerals, says Dr Sarah Jarvis of the Jeremy Vine show. And it might be necessary in African countries with poor nutrition. But a healthy diet is easy to achieve in California without supplementing it with clay. "Therein lies the difference," Jarvis says. "And nobody could be doing this for fun."